While manufacturers of smartphones and tablets teach them not to break down in the water (like Sony), and wait for Apple’s magic hours, Google has developed an unusual gadget – augmented reality glasses Google Glass. The first batch of glasses (of 2,000 items), the company has released to the market in April this year. Screen resolution of points – 640 to 360 points, the user perceives it as a 25-inch screen at a distance of 2.4 meters. 5-megapixel camera can shoot video at 720p, all information is stored in the cloud storage Google. Computer display in Google Glass is located just above the eye, a person not to be distracted from the main activities. Glasses come with built-in Bluetooth and Wi-Fi, allowing you to transfer files via smartphones. Showing the possibility of Glass, Google says the unusual aspects of human life: skydiving, horseback rides, control of the aircraft. Videos about it, made with the aid of glasses, really impressive, repeat this with traditional cameras would be quite difficult. As it would be difficult to fix the child’s reaction when you were circling him, and he leaping laughter. In the commercials users are not pretty pictures, but the truth of life – that people crashed into a pole, because the message was carried away on the screen. Another oblilsya hot coffee until someone called him. The creators of the third roller bit exaggerated – messages flicker before the eyes of a man wearing glasses all the time, too clever computer tends to tell all – and the weather and traffic reports, and the nearest bus stops, and a feeling that the man does nothing that communicates with virtual reality, mechanical walking in real life. With the help of a miracle glasses can learn background information (eg, the flight schedule), “write” sms, read the facts (what is this bridge? ), Translate what they saw (the price tags on goods abroad), take photos and videos, share them on social networks. Welcome back! Not in the Google Glass! But not all were pleased to accept the revolutionary new product from Google. Some American cafes and restaurants refuse to serve users Google Glass, fearing that it could violate the rights of other clients on privacy. Similar requirements expressed by representatives of American cinema (can be conducted unauthorized recording), Casino (Points can be used for fraud), and strip clubs. In addition, the glasses are called perfect spy tool. But in Western Virgin in law wants to ban gugloochki while driving, as they will be difficult for a person to focus on. In most of Google, by the way, advised parents not to give points to children, and people who do laser eye surgery, consult your doctor first. The implementation of this does not look like anything else ideas on how augmented reality glasses, Google will require more effort in various fields – and to deal with the “reactionaries”, and to overcome the fears in people. An average consumer is a psychological barrier to the use of unusual points. The choice in favor of doing so far the only ones who generally gives priority over personal contact information. This is who speaks little, but it is clear that persistent stay in the virtual world (albeit quite useful) must be reflected in real life. And problems like constant surfing the internet, gaming and many hours sitting out in social networks will become even more acute. Only one out of 10 smartphone owners will be wearing glasses from Google. According BiTE interactive, which experts interviewed 1,000 Americans, 45% would not have to wear these glasses, as they do not seem to them aesthetically appealing, and walk in them they would be uncomfortable device, in their opinion, will only irritate. Even if the cost is quite low (currently $ 1,500). 44% of those to whom the idea of ​​going to such points like, first of all like to take photos in a new way, to make calls and record video. He even interviewed in these glasses, but admits that the sound quality leaves much to be desired, will have to work hard to improve the quality of the recording. In addition, he had to sit still during the interview that the recording was good, it did not relax during a call. When, during a lecture on journalism in one motion, he took a picture of the audience, the audience gave a sigh, but it was not a sign of admiration technology and experiences on the topic of privacy. At the same time, the advantages are obvious Google Glass – the wife of the journalist, the beekeeper, wearing glasses could make interesting pictures of bees, it is unlikely that we would have with a conventional camera. Robyn Peterson, CTO of Mashable, is Google Glass, when communicating with children. Not a smart phone or tablet is not allowed to make such images, which allow you to make points. But recognizes that in public he feels this devayse little strange. What he would like to see in the future, so it is an application that reads barcodes on the packages of products. Then he’d have worn glasses, at least in the stores. Journalists willing to speak about the new applications for Google Glass, however, install them now are just lucky-testers. Appendix Winky will take pictures as soon as you hear the command «Glass take a photo», you can also press a special button to activate the camera. Appendix Glass to Facebook still does not have full functionality, but allows to publish photos of “glasses out” in the social network. Glass Tweet Send to Twitter tweets and pictures. In the glasses also “present” Reddit and Glassagram, like Instagram, which also can be applied to photos of filters. Youtube to Google Glass called Fullscreen BEAM, you can post a video to a large number of users, as well as in a private manner. Then it will be possible to “share the” in Twitter. Work on their own application for glasses and Evernote. The application for those who can not remember the names and faces of people, – MedRef for Glass. Another page in the history of the miracle points. Not the usual functional movement (such as Facebook) to a new level, and in general a new approach to work and life. The project came up, mainly for hospital workers. The program uses face recognition technology. Before the user’s eyes will be a folder with photos and notes. The doctor will be able to make note of that person, for example, is allergic to nuts, and this information will be available to all medical staff. The first media released “on the glasses”, became The New York Times. The newspaper will be for the user to read out the agenda and key news. 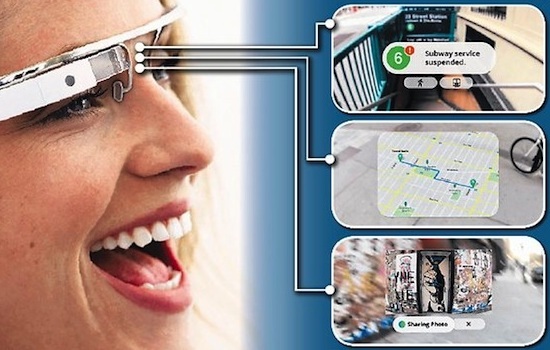 Although the glasses only being tested, they have a very small number of people, and Google itself is in no hurry to name the date of receipt of the device in stores, analysts expect the growth of the market applications for Google Glass up to $ 6 billion by 2016. The man in glasses looks, to put it mildly, strange. He seemed to be rolling his eyes, makes them different unusual movement. Given that the eyes in the first place give different mental disorders, intoxication, or even an ordinary fatigue, such a concentrated way out of the ordinary behavior can not but attract attention. In addition, people now and then for the bow points, for example, to activate video recording (and it looks like a nervous tic.) In general, wearing glasses, by definition, will strongly differentiate you from other people, and not surprisingly, since the user at the same time as it is in two worlds – the real and the virtual. And it is unclear which of them anymore.